The SILP is a comprehensive approach for improving food security amongst the most Vulnerable Swazi populations in the Lubombo and the lower Shiselweni regions. Approximately 2500 Households (HH) (approximately 12,500 beneficiaries based on the average HH size of five) and 40 Neighbourhood Care Points (NCP’s) (approximately 1 000 beneficiaries aged 0-5) have been targeted. The aim is to improve sustainable agricultural production while building the capacity of rural families to better manage local natural resources and improve their economic coping strategies (including Savings and Internal Lending Communities-SILC) to make them more resilient to external shocks. However, improved food security alone does not necessarily correlate to improved health status. The project therefore also seeks to promote healthy behaviors by improving nutritional knowledge and hygiene practices such as hand washing, basic marketing and business skills training, training of caritas staff and agricultural field agents in conservation agriculture which learning and good practices eventually cascades to the beneficiaries, natural resource management and reinforcing key HIV and TB prevention messages amongst beneficiaries. 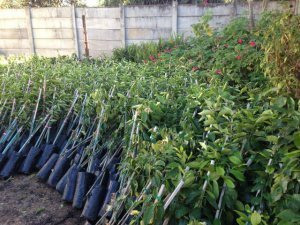 As part of the initiative to diversify the sources of food that at are being produced and consumed by the beneficiaries, Caritas is also giving each of the 2500 Households three fruit trees of selected varieties that are acceptable to the local population and the area where the trees will be planted. This activity is done in collaboration with the Swaziland Ministry of Agriculture and Cooperatives. The beneficiaries have been trained on how to care for the trees. The selected varieties are: oranges, mango, naartjie, lemon and pawpaw. Over and above the fruit trees the 2500 targeted vulnerable Households in the two region have constructed backyard gardens and have been given all the necessary inputs and training to succeed. It is hoped that at the end of the project in March 2014 disadvantaged families within the Lubombo and Lower Shiselweni regions will have improved food security through sustainable agricultural practices.